Te lo Dije: According to the Post, Marco Rubio not being vetted for V.P. Did I not say, when it comes to Romney VP picks, Incredibly Boring White Guys, Get in Line? Today the Washington Post is reporting that Mr. Dream Act Lite is not being seriously vetted by the Romney campaign. While some like Chris Cillizza argued that the VP fortunes of el senador de Florida had risen as a result of Mr. Obama’s dramatic announcement last Friday of a change in immigration policy, I have thought that to be non-sensical. (Cillizza has re-considered his analysis as of today’s report). The Administration essentially enacted Rubio’s imaginary Diet Dream Act (he never actually wrote a bill) last week with the stroke of a pen. After that, what does Mr. Rubio actually offer a Romney ticket? A reminder to the Latino community that he and the GOP still oppose a real, permanent solution – a path to citizenship for undocumented people? 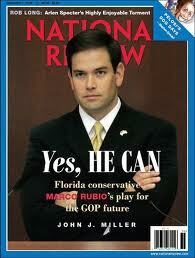 A favorite in conservative straw polls, Marco Rubio can make the cover of the National Review but apparently not the Romney vetting machine. Of course, in the end, things could change and maybe the Romney team could end up picking Rubio, who they say today they are not vetting. One can Dream — the last time the GOP picked a Lightly Vetted V.P. Candidate things got way fun. So whose VP fortunes are rising? The guy who fled from the presidential campaign the second he was embarrassed in the Iowa Straw Poll by Michele Bachmann, the Congresswoman from Minnesiowa?